If it feels like you’ve been hearing a lot about semiconductor stocks lately, you have. With the tech sector leading the market lower during the most recent downturn, there’s been a great deal of attention paid to one of its most conspicuous industries—chipmakers, which have taken the brunt of much of the selling. Establishing a higher low is a good start, and the SOX will likely need to build on it—soon—to convince investors that a return to long-term bullishness is in the works. Traders, on the other hand, have more immediate concerns. Nvidia (NVDA), which made a name for itself producing semiconductors for the gaming industry, has built on its core strength through the happy coincidence that the blossoming world of artificial intelligence (AI) uses the same type of chip. And today after the close, NVDA will release its latest quarterly numbers. No one knows what they’ll be. What we do know is that Nvidia has a 31-quarter streak of beating its headline earnings number.3 That doesn’t mean all that much, since earnings announcements include all kinds of info that can offset an earnings beat, especially a downsized future performance outlook or a big revenue miss. ●Five days after earnings NVDA was higher 20 of 31 times (65%) and had an average gain of 4.5%. ●On earnings day (today), NVDA declined from the open to the close 18 of 31 times (58%) and had an average loss of -0.3%. ●On the day after earnings, NVDA closed higher 19 of 31 times (61% of the time) and had an average gain of 3.82%. 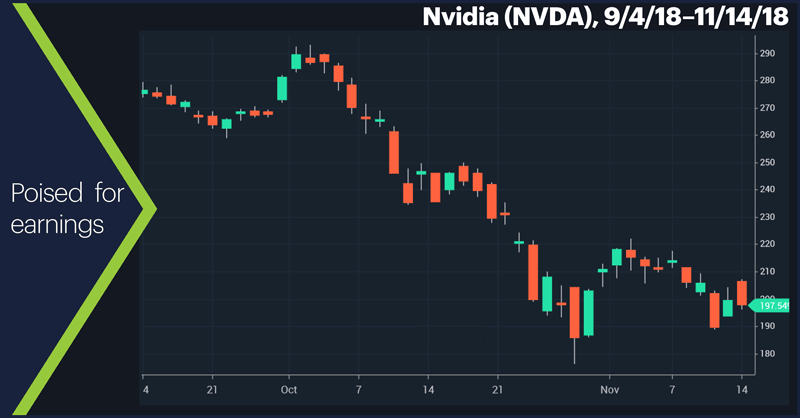 ●Of the 12 times NVDA closed lower the day after earnings, there were only three instances when the stock rebounded to trade higher after five days. In other words, don’t look for an immediate rebound if the stock closes lower the day after it reports. 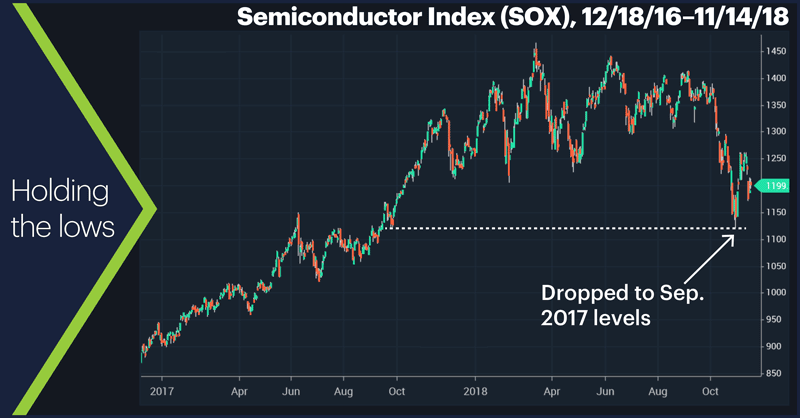 Whether, or how these tendencies tie into the larger semiconductor story remains to be seen, but that’s a matter for investors. Traders have the option of acting on short-term developments and letting the longer-term trend take care of itself. Market Mover Update: Yesterday’s 2%-plus intraday crude oil bounce (off the 61.8% retracement level of the June 2017–October 2018 rally) faded a bit as the day wore on, with January WTI crude futures up closer to 1% late in the trading day. Today’s earnings include: Energizer (ENR), Spire (SR), Wal-Mart (WMT), America's Car-Mart (CRMT), Applied Materials (AMAT), Nordstrom (JWN), NVIDIA (NVDA), Post (POST). 1 CNBC.com. Goldman Sachs sees a correction coming for chipmakers but still likes Nvidia. 10/18/18. 2 Investors Business Daily. Nvidia, Xilinx Stocks Upgraded To Buy On Artificial Intelligence. 11/13/18. 3 StreetInsider.com. Nvidia (NVDA) Earnings. 11/14/18.